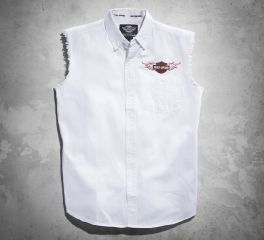 Show off the strength of your character (or your latest tattoo) with classic Harley-Davidson® men's sleeveless biker shirts – in a variety of fabrics, from denim to basic cotton style. The Iron Block Blow Out is loaded with classic style. For starters, the durable cotton twill is run through a wash for a dirty, worn look. 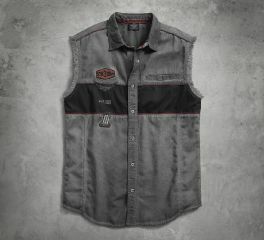 Next, this men's sleeveless shirt is detailed with our classic graphics. The high-quality embroidery and appliqué drive home our timeless style. 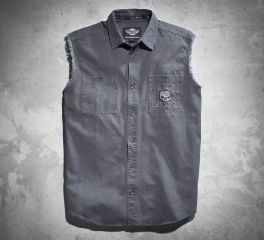 The skull blowout raises the rebel-bar on the biker-basic. 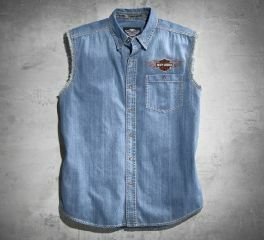 Harley-Davidson® Flames Denim Blowout. There's nothing else to say.